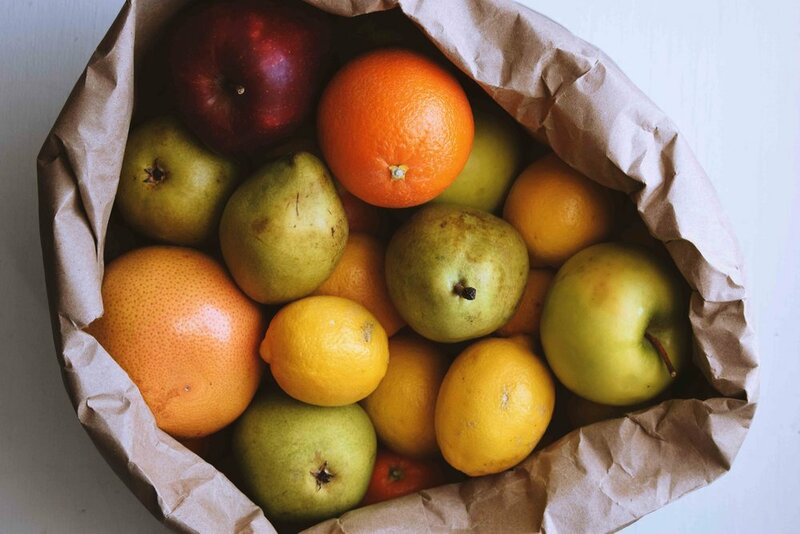 Subscribing to a fruit and veg box scheme could be a good place to start if you’d like to reduce the amount of plastic waste you produce. Not all of us have the time, or will to shop around for the best zero waste options, especially when as consumers, we have become accustomed to convenience and besides, not all of us have a local farmer’s market or greengrocers. Therefore a win/win situation could be to have your weekly fresh produce delivered right to your doorstep, minus the excessive packaging normally provided by your local supermarket. I have listed a few box schemes based in the UK but if you live elsewhere, then be sure to check online to see what fresh produce delivery services are running in your own country or vicinity. To my knowledge, all of these schemes use minimal packaging and only when necessary. PACKAGING- delivered in cardboard boxes which are then picked up and reused. Extra packaging is only used when absolutely necessary, to protect the fruit & veg while on its way to you or to keep it fresh. Most of their packaging can be recycled or re-used and they are actively looking for alternatives to plastic in an attempt to further lessen their environmental footprint. PRICE RANGE - £5.25 for a bag of fruit to £30.95 for bumper fruit box. DELIVERY- free to most of the UK. PACKAGING-Riverford have pledged that by the end of 2020, their veg will be 100% plastic free. Presently the boxes are delivered in recycled cardboard boxes that are collected from customers to use again for up to 10 times. Where extra packaging is absolutely necessary, they choose the most sustainable solutions that fit the product’s needs such as compostable pulp punnets and compostable beech nets (a by-product from PEFC-certified sustainable forestry) which can be easily disposed of in your home compost heap or council compost bin. ALSO - All produce is organic and they offer a UK veg box if you only want local seasonal produce. They use the highest spec vans, carefully plan routes and train the drivers so that vehicles run as fuel efficiently as possible. DELIVERY - Free to London/Greater London areas. PACKAGING-delivered in cardboard boxes which are then reused or recycled. All extra packaging is 100% recyclable or degradable (unless already packaged for supermarkets by their suppliers). ALSO- They buy ‘odd’ produce from local growers & markets at a fair price. They always try to put local growers at the forefront of everything they do. At certain times of the year there’s a limited availability of produce, and certain fruit varieties don’t grow in the UK at all, so produce may be sourced from abroad to provide you with an interesting and healthy selection in your boxes, they might not necessarily be misshapen but in most cases are surplus as a result of over ordering from the supermarkets. 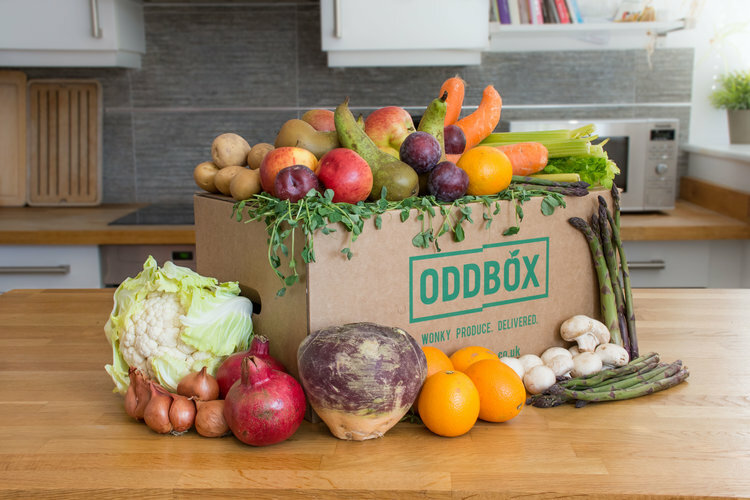 Oddbox partner with local charities to donate up to 10% of their produce to charity and help feed those in need. DELIVERY-minimum spend of £40 for all deliveries. Delivery varies from free to £4.00. Delivers to most of London, Bristol and Bath. ALSO- Not all produce is organic as Farmdrop believe that shopping local is also important even though a supplier may not be certified organic. When ordering, there are added options to filter by such as 'No packaging', 'Plastic free', and 'Return to us'. Packaging from products marked 'Return to us' will be returned for re-use by the original producer. Farmdrop run a 100% electric delivery fleet at the expense of being able to serve a wider geography. DELIVERY- free delivery to North of England, Yorkshire, Derbyshire and Northumberland. PACKAGING- Delivered in cardboard boxes which can be returned to be reused. They try to keep packaging amounts to a minimum but when it is necessary, they will use as little plastic as possible, abiding by recycling principals. The Organic Pantry continually source recycled and recyclable materials wherever possible. However if you do want a box completely plastic free, let them know they are more than happy to oblige. ALSO- Produce is sourced as close to home as possible. In the peak UK season, 85% of the vegetable box contents come from the farm itself or local sources. Unfortunately, there are certain times of year when this proves more difficult and they may have to ship from overseas which is always freighted by land and sea - minimizing their environmental impact.